Previous: I wonder how much this UI mistake is costing Spotify? iPhones are wonderful things for many reasons, but you can’t run screen-recording or screen-sharing software in the background during research sessions. Even if you could, it would make the device run like treacle and you’d miss out on getting footage of your user’s fingers, which is pretty important. This makes using a sled a good idea. A sled is the thing you use to mount a camera onto your mobile device in a usability testing session. It allows the user to hold the device in their hand and move it around in a relatively natural way, while ensuring the camera is always focused properly on the screen. If you were to buy one from a lab supplier, you could end up with something heavy, over-designed and expensive – as much as $3,500 for a sled with two cameras! The fact is, you can easily avoid the cost and make your own. This is probably the most unremarkable piece of plastic in the world, but it’s cheap and it’ll save you trying to cobble something together with office equipment and duct-tape. 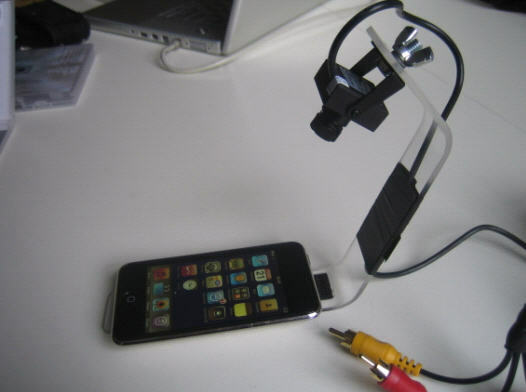 The idea is that you mount a small webcam facing down on the top lip, and mount your iPhone on the bottom using adhesive pads (use an iPhone case if you don’t want to dirty up your device). Most modern webcams can deliver a fairly high resolution picture if you meddle with their settings, but be sure to turn on manual focus, or you’ll find the camera will keep trying to focus on the user’s fingers rather than the screen. I use Morae to record the sessions and stream them live across our internal network. An added bonus is that Morae V3+ supports dual cameras – so you can record the user’s face picture in picture with a second webcam. A Morae license is pretty expensive though ($1,495 USD! ), so if you don’t already have one, you may want to use some relatively basic recording software that simply records the video and audio feed to a file (you probably got an app bundled with your webcam). Silverback would probably work with an external webcam, though the screen recording part would be redundant- if you try it, let me know how that goes. You’ll see in the comments below that Nick Bowmast has added a couple of really useful tips. 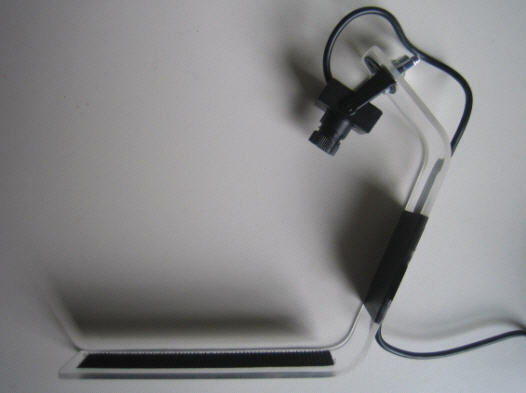 Firstly, you can use a rectangular piece of acrylic and bend it to shape over a household toaster, which means you can easily do it at home and you don’t need to bother even cutting the acrylic to shape. Secondly, if you don’t mind using an analog camera with RCA connectors, you can use a micro CCTV camera. Nice work. How does the phone attach to the mount? You should knock up a load of these and sell them on. Plastic merchants aren’t that common. In terms of attaching the phone, it depends how precious you are. You could use adhesive pads or you could glue a flexible case to the mount, which would allow you to pop the phone in and out. This is a great idea, very resourceful! Tell me, how do you use Morae in this situation? How are the “observer” and “recorder” set up? Thanks! If you are using morae 3 or above, the set up is easy as it has a setting for mobile device usage. If on an earlier version the set up is a little trickier. On the recording PC set the screen recording to a low res (say 800×600) and tinker with the camera settings until you have an adequately high resolution and frame rate. Be sure to do some test projects to be sure your configuration works in anger! I’ve put a few of these together, more recently USB powered and the bent plastic rig works well. I’ve found, though, that it’s hard to get a close look at what participants are actually doing on screen/buttons while also keeping out of their face or looking over their shoulder. It’s an old-school method but works really well. Type this product code into their search box: 220706 .. it’s Â£29.95 and focuses well at these short ranges. I connect the RCA cable to a small (14″) TV screen and plonk it down right in front of me, so I can get a really clear view of all the participant’s interactions while letting the participant get on with it a metre or so away. You’ll see I’ve used a wingnut to attach the camera to the rig, this makes it easy to switch the angle of the camera from portrait to landscape view. The video and audio feed (yep it’s got a mic) can also be relayed through to a second screen in an adjacent room with client/observers. I use self adhesive velcro strips to attach phones etc. to the rig. Be warned with these things though, you might get a cloer look at people’s fingernails than you might be used to ! I’ve just had a quote from Tracksys for a similar rig (pictured here), and it weighs in at about Â£750, including the mini camera (That’s about $1110 USD). Not cheap! It supports many of the ideas in your post. She suggests a cheaper alternative by using Cam Studio instead of Morae, although I guess you’ll have to do a bit more work putting the video feeds together with this option. Yeah Belen and I chatted before Euro IA. I like her software solution! Great guide Harry, I remember a lab in Germany that had a sled designed and crafted in aluminium for mobile testing, it’s structurally similar to yours, the only difference being theirs cost a bomb! Thank you for this article, it has been a true inspiration for us to kick-start our first self-organised games usability sessions. Here’s our take on the sled! 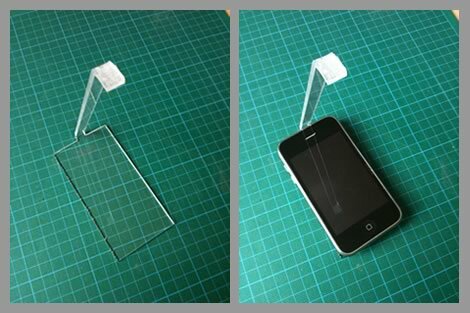 We made some alterations – we attached the acrylic to a hard plastic device case. Hope it’s helpful for some people as your article has been for us! Pingback: Recording mobile device usability testing sessions â€“ guerrilla style | Melbourne, as in the city. Do you not find having a camera rig makes the user interact in a different way i.e. Its heavier, users will hold it differently than they would naturally? We currently use apple TV and stream/record the screen on another machine. This company offers a cut-to-size service for Perspex one-offs. They will even round off corners, drill holes and polish edges. All you would need to do is make two bends using a toaster as an improvised strip heater! Pingback: Usability Testing Of Mobile Applications: A Step-By-Step Guide - IT? ?